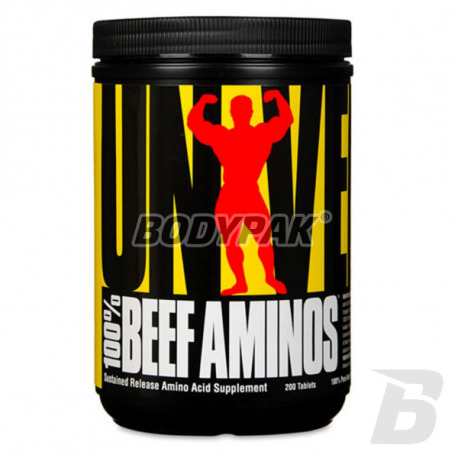 Amino AcidsUniversal Nutrition 100% Beef Aminos - 200 tabl. 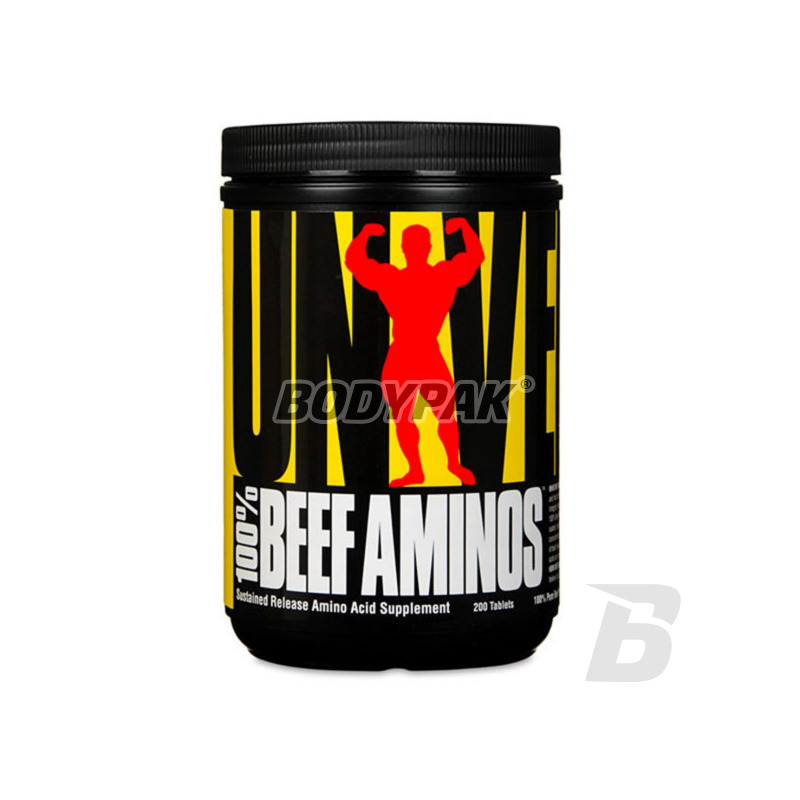 100% Beef Aminos - is designed for all those who seek the highest quality amino acid product. 100% Beef Amino provides the highest quality nutritional concentrated formula that provides a very wide range of exogenous and endogenous amino acids necessary for the proper conduct of anabolic and anti-catabolic support the processes occurring in the muscle tissue. 100% Beef Amino is a maximum effective formula for protective muscle tissue and is designed for all persons engaged in strength training and / or endurance training. The presence of all essential amino acids in one formula enriched with glutamine ensures maximum muscle adaptation to exercise performed. BCAA (L-Leucine, L-isoleucine and L-valine) with glutamine naturally occurring in the optimum mutual relation not only to support the proper functioning of muscle tissue, but also increase the body's immunological resistance, impaired after strenuous exercise. In addition, they take an active part in the regulation of body fatigue. Applied to a wide spectrum of amino acids, including amino acids glukogennych maximum supports energy metabolism and the most important metabolism that occur at the cellular level necessary for rapid and efficient adaptation of the exercise of the body. 100% Beef Aminos can be used by a broad group of physically active people. It will be perfectly checked in strength sports and strength-speed events, endurance sports, sports, mixed and team sports. 100% Beef Amino can also be used to supplement the diet with essential amino acids in a period of increased demand for high quality protein. One serving (2 tablets) for each meal in order to increase the content of amino acids in the diet. In order to ensure a constant supply of amino acids one serving (2 tablets) between successive meals. Inne składniki: 100% kompleks aminokwasów wołowych (izolat białek wołowych, koncentrat albuminy wołowej, drobny wątroby z wołu Argentyńskiego), fosforan diwapnia, celuloza mikrokrystaliczna, kwas stearynowy, stearynian magnezu, lecytyna rzepakowa, glazura farmaceutyczna.